Is It Spring Yet? Well, Fishing Season Has Started, Anyway! Walking south on Union Street last week, I saw several guys fly-fishing in Hannah Park, casting their lines patiently into the swirling Boardman River, right here in downtown TC. And not without good cause. On the same walk, I wandered past the newly-restored west branch of Kid’s Creek that Munson Medical Center rerouted last fall (if you haven’t visited this beautiful little park by the hospital, you really should) and saw two monster trout wrestling their way upstream. 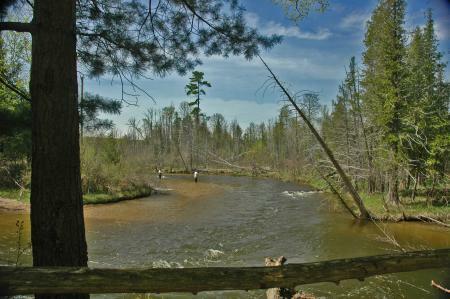 For years, veteran fly-fishing enthusiasts have kept the storied streams, lakes and deep waters of the Traverse Bay area to themselves, letting the rest of the world forget that northern Michigan – haunt of the young Ernest Hemingway and birthplace of the fabled Adams Fly -- was once famed as an angler’s mecca. Reilly’s source: local outfitter and guide Chuck Hawkins, who came to northern Michigan from Los Angeles 16 years ago after looking at better-known places like Jackson, Wyoming. It’s no slouch in the world of bass fishing, either. Down in the Deep South, it’s no secret that they pride themselves on their bass fishery, but Don Wirth of Bassmaster heads up from Nashville every summer to do a little fishing in Traverse City for his popular “Day on the Lake” column. Don has fished all of America’s premier bass venues and calls Traverse City the best place in the U.S. right now to catch a trophy smallmouth bass. Grand Traverse Bay and the inland lakes near Traverse City are the favorite smallmouth waters of Kevin VanDam, who’s regarded as the best competitive bass fisherman on the planet. Legendary bass angler Hank Parker, host of the popular TV show Hank Parker’s Outdoor Magazine on the Versus network, filmed two shows here -- one on the Bay, the other at a nearby inland lake. Local bass guide Capt. Chris Noffsinger, who has garnered a national reputation in the fishing media for putting his clients on big bass, said the bass fishing in Traverse City is “awesome” from the last Sunday in April, when Michigan’s catch and release season opens, through late fall. For really big fish, of course, anglers head to Traverse City for lake trout, brown trout, steelhead and salmon in Grand Traverse Bay. The secret here is that although the Bay’s rich waters are deep -- 600 feet in some spots -- they’re close to shore and protected by land on three sides. That means boats can get to the fishing grounds within minutes, and are usually immune from the heavy seas that can make fishing the open waters of Lake Michigan an uncomfortable experience when the wind is up. 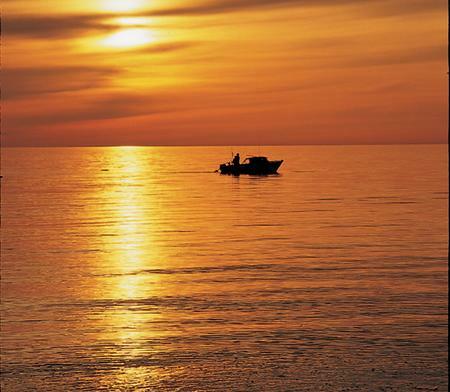 Michigan fishing licenses are available online. And since Traverse City boasts over 80 hotels and resorts, it’s easy to find comfortable and affordable lodging with ample parking room for your trailered boat. There are plenty of boat launches close to town, so you can get in and out of the water without too much fuss.